Republican Sen. Chuck Grassley has a long list of issues to tackle as the new chairman of the Senate Finance Committee, including drug prices and trade. Grassley sat down with Yahoo Finance to talk about some of the biggest issues facing the committee this year. Lawmakers are gearing up to consider the renegotiated NAFTA, called the United States Mexico Canada Agreement, or USMCA. The House will consider the deal first, but Grassley told Yahoo Finance he expects to have Senate Finance Committee meetings on the deal before the House takes action. Grassley said he needs to work with Democratic lawmakers on three main areas: enforcement, environment and labor. Grassley also called on President Trump to lift the steel and aluminum tariffs on Canada and Mexico. “He put these tariffs on, if you recall, to force negotiation. So he successfully negotiated. He says he has a good agreement. Then what's this business that maybe we still have the tariffs on?” said Grassley. The senator from Iowa says the steel and aluminum tariffs and retaliatory tariffs are hurting farmers in his state. The tariffs also don’t encourage Canada or Mexico to approve the deal. “So whether it's Mexico or Canada or the United States. All three countries are saying to the president of the United States, you've got to get rid of these tariffs. And I'm of that same opinion,” said Grassley. Grassley said he has not talked directly to President Trump about lifting the tariffs, but he’s spoken to administration officials. “I would tell him [Trump], like I'm telling you, and I would say it from a standpoint of intellectual honesty: ‘You said to these countries, these tariffs are gonna be on till you negotiate. The negotiation's over. You ought to do your end of the bargain, pull back the tariffs’,” said Grassley. After grilling pharmaceutical executives on Capitol Hill this week, Grassley admits he has some “skepticism” Congress will pass legislation to lower prescription drug prices. Throughout the hearing, several executives talked about the need for rebate reform. The Trump administration has proposed a rule to curb rebates given to pharmacy benefit managers in Medicare and Medicaid programs. Grassley said he supports the administration’s proposal, but the hearing showed him that more needs to be done. “I learned from them [pharmaceutical executives] that that isn't going to be enough to reduce the list price. That you have to get to the non-Medicare people that use prescription drugs in order to do it,” said Grassley. Grassley and ranking member Sen. Ron Wyden (D-OR) have also opened an investigation into the price of insulin. The senators recently wrote letters to the leading insulin manufacturers – Eli LIlly, Novo Nordisk and Sanofi – asking for more information about their pricing. Grassley said he’ll wait to decide if he’ll call on those CEOs to testify until they respond to the letters. “I would hope that we're going to embarrass [the insulin manufacturers] to some extent like we embarrassed Mylan on Epi-Pen, if you remember. 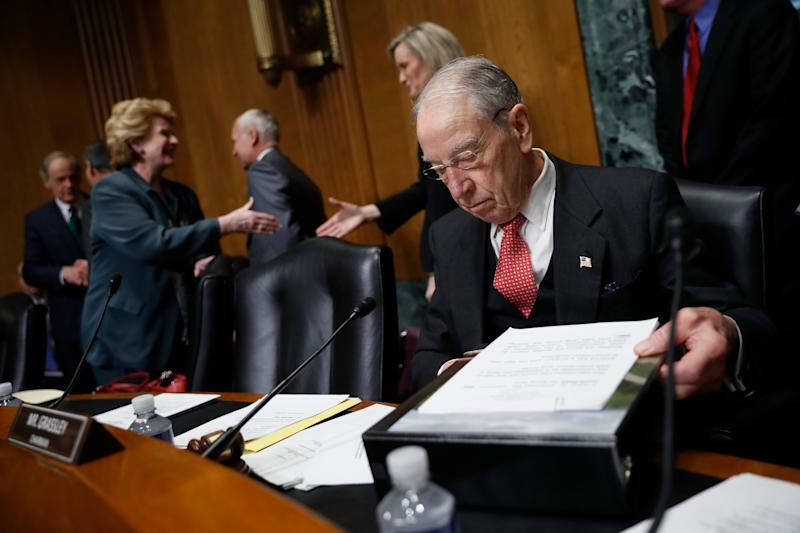 To maybe be a little more common sense in their approach of prices, particularly when you got a drug that's 80 years old, or maybe been on the market longer now,” said Grassley. Despite the broad bipartisan support for tackling the issue, Grassley acknowledged it will be difficult to send a bill to the president’s desk. He has several bipartisan bills aimed at lowering costs. Grassley also weighed in on the recent tax refund controversy. On Thursday (shortly after our interview with Grassley), the Treasury Department said the average tax refund is up 19% from last week and is now slightly higher than last year. But throughout February, there were complaints about lower refunds – which brought about renewed criticism of the Trump tax cuts that were passed at the end of 2017. People shouldn’t focus on their refunds to determine how much they paid overall in taxes, he said. “It’s stupid to think [if] you got a bigger or lesser refund that your taxes have gone up or down. It's got nothing to do with it,” said Grassley. Grassley has said he’s frustrated with Democratic politicians who are using lower refunds as a way to attack the GOP tax bill. “It's just a big lie to lead people to believe that if you get less refund than you got last year, your taxes have gone up. No, the common sense approach and the only honest answer is look at the bottom line of what you filed [in] 2019 with what you filed in 2018, and if it's less in 2019, then you got a tax decrease,” said Grassley. The Treasury Department notes refund data will continue to fluctuate over the coming weeks. “We caution against drawing broad conclusions on refunds overall this early in the filing season,” the Treasury Department said in a statement.